JJC RC Series Rain Coat is compatible with Canon and Nikon DSLRs with telephoto lens such as Nikon AF-S NIKKOR 70-200mm f/2.8G ED VR II and Canon EF 70-200mm f/2.8L USM. RC series rain coat is compatible with lenses whose length is no more than 22 cm (8.6 inch). This series rain coat is made of high-quality materials and can protect your camera from rain, dust and mud effectively. The built-in transparent window makes the top and monitor of your camera visible and also gives you full access to camera controls. In addition, the unique eyecup port design on the transparent window ensures there are no obstacles between the eyecup and viewfinder. With the Velcro design, the size of the rain coat can be adjusted by size of your camera, so that it fits closely your camera. Meanwhile the arm sleeve allows you to stick your hand in and control the camera. RC series rain coat is also tripod mountable. Besides, this rain coat comes with a cleverly designed built-in eyecup pocket that is used to store the eyecup and other things. With this rain coat, it will be more convenient to take photos in the rain. 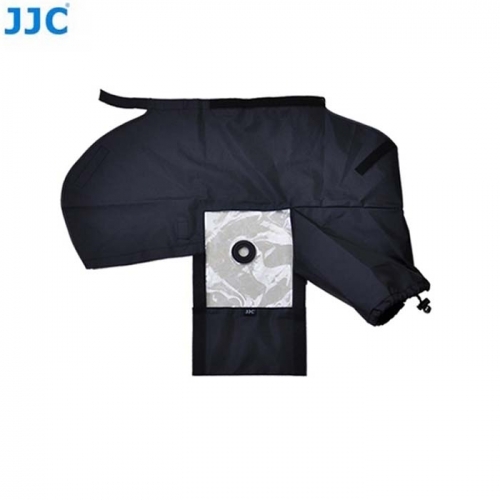 RC series rain coat adopts a unique design of using the eyecup to mount the rain coat to a camera, and there are 3 raincoat models.